The 2013 FAI Arbitration Rules and FAI Expedited Rules are now available in German language. 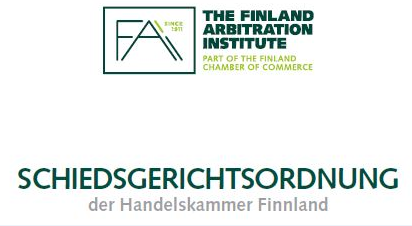 In this way, the 2013 FAI Arbitration Rules and FAI Expedited Rules are available in six languages: English, Finnish, Swedish, Russian, Spanish and German. The FAI would like to thank Attorney at law Mika Pöpken (Helsinki), Attorney at law Gustav Flecke-Giammarco and his team (Munich), and FAI Case Manager Adriana Aravena-Jokelainen (Helsinki) for their dedicated contributions to the German translation of the Rules. See the German translation of the 2013 FAI Arbitration Rules here and of the 2013 FAI Expedited Rules here. FAI administers domestic and international arbitrations governed by its Arbitration Rules and Expedited Arbitration Rules. Further, it appoints arbitrators in ad hoc cases when the arbitration agreement so provides, and acts as appointing auhtority under the UNCITRAL Arbitration Rules. FAI also administers domestic and international mediations governed by its Mediation Rules.